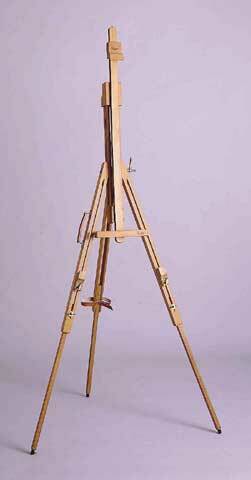 The sturdiest folding sketch easel available. A must have for artists that require strong easel's. This easel is constructed of oiled beech wood and folds up into a compact unit weighing only 8-1/2 lbs. In addition to its light-weight design, a leather carrying handle makes the easel readily portable. A single, heavy-duty wing nut adjusts the rake’ s angle to any position between vertical and horizontal. The easel’ s maximum canvas height is 78".